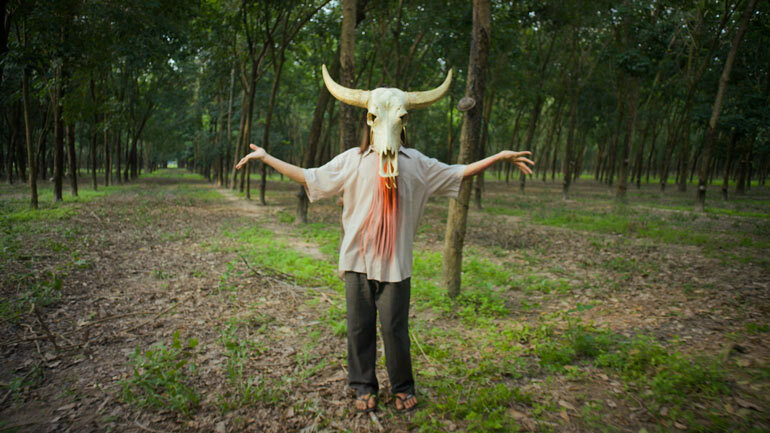 Produced by artist collective The Propeller Group, The living need light, the dead need music combines the genres of documentary, music video and feature-length film with the sound of Vietnamese mourning refrains and a marching band. This recently acquired work takes audiences on a fantastical funeral procession from the urban laneways of Ho Chi Minh City to the waterways of the Mekong delta. The Propeller Group were established in 2006 by Phunam Thuc Ha (b1974, Vietnam), Matt Lucero (b1976, United States), and Tuan Andrew Nguyen (b1976, Vietnam). Adopting the guise of an advertising firm, the trio — who describe themselves as a platform for collective thinking and coordinated actions — continue to delight and confuse as they blur the boundaries between fact and fiction.